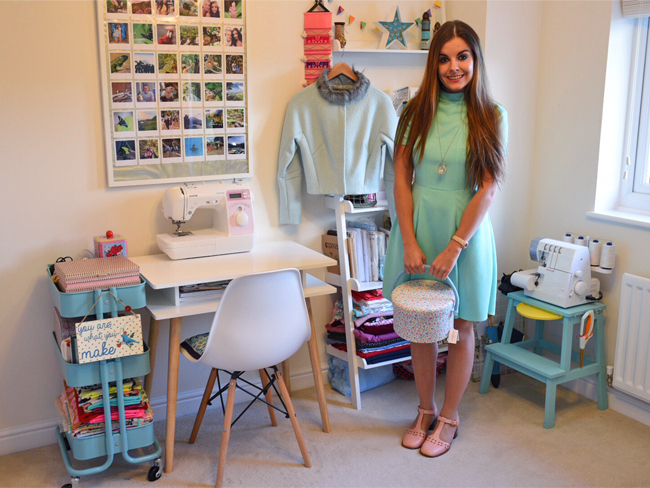 Tilly and the Buttons: Sewing Space Tours... Jade's Kitsch Haven! 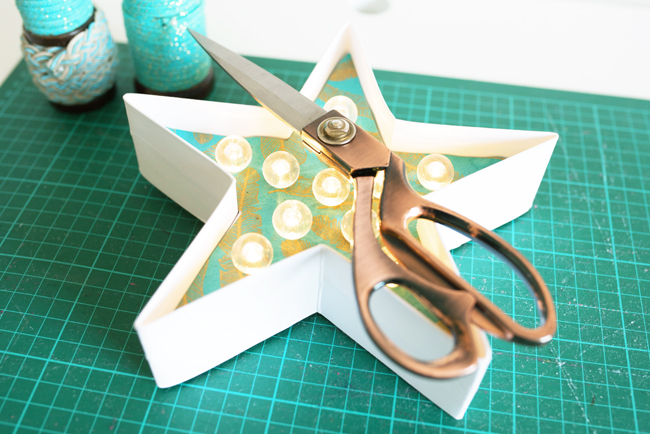 Sewing Space Tours... Jade's Kitsch Haven! Hello! I’m Jade, welcome to my little sewing sanctuary in sunny South Wales. I am relatively new to the realms of dressmaking and have only really been getting to know my way around a sewing machine for the past three years. By day I work in an office-based role in Bristol but by night can be found in my little sewing haven, musing over my next big make. I have always been a creative individual and have enjoyed crafting from a young age. At university I studied Graphic Design, which instilled my admiration of beautiful craftsmanship and contemporary design. There was a time when I believed my love for fashion and textiles would be limited to high street trending ready-to-wear garments. 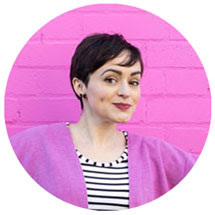 Learning of the wonderful indie sewing makers movement really changed all of this for me and after pouring over many inspirational sewing blogs (including Tilly and the Buttons! ), I wanted in! In the beginning I attended a brilliant beginners dressmaking class and learnt basic skills and techniques but soon realised that if I was going to take the next step I’d need to make some room at home to build upon these skills! 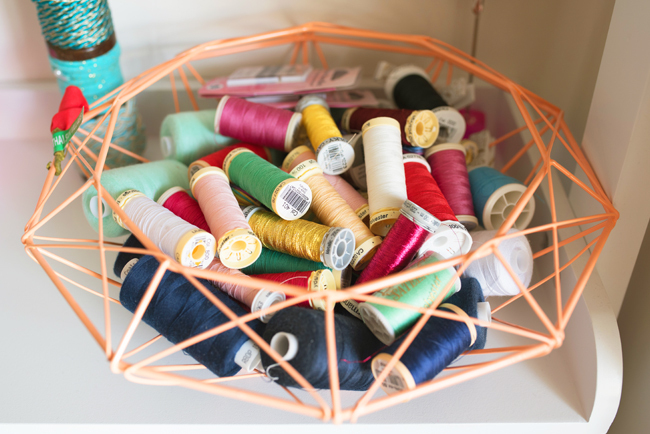 I started off sewing at home at my kitchen table but soon yearned for a larger space to store all of my dressmaking paraphernalia, which was growing at an alarming rate! Two thirds of my spare bedroom has thus been transformed to home a retro writing desk, some shelving, a storage trolley and a few trinkets to decorate. Overall I’d probably say that my space has a bit of a kitsch vibe about it while still being quite minimalistic. I try not to sprout out too much as the other the other third of the room is occupied by my rather understanding boyfriend who uses his space for his photography hobby, and our pet lizard (‘Lizzy’). 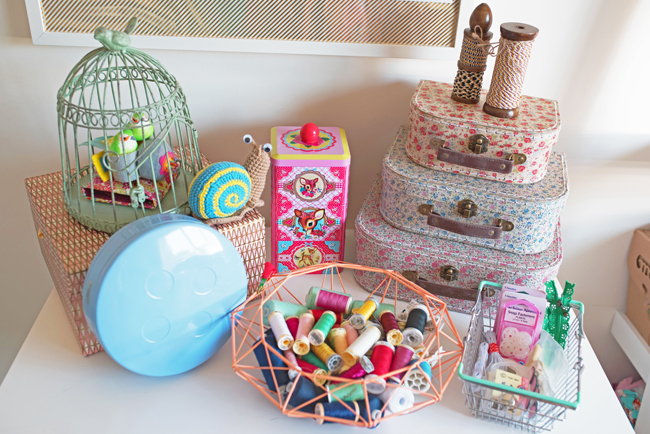 Quirky storage boxes and prettily patterned tins are a bit of a weak spot - I love a good storage solution! Not only do I find it quite therapeutic categorising all of my notions, tools, threads, patterns and fabric but I also find it much easier to pick up a project if I know where everything is. 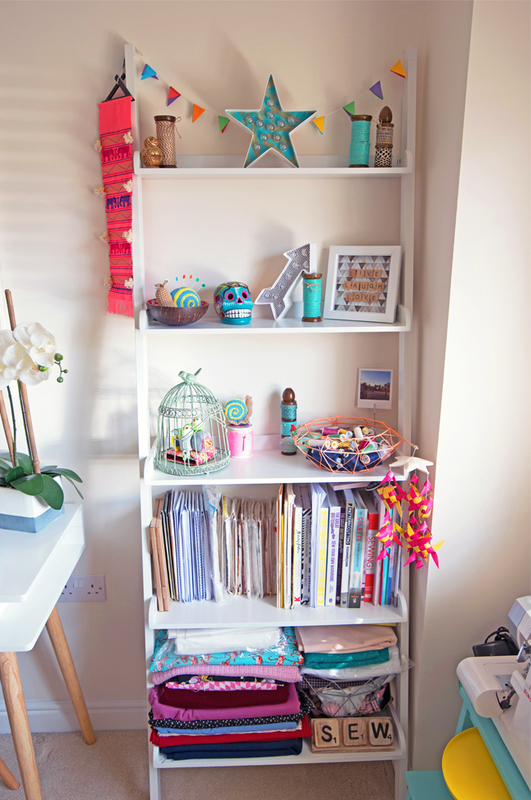 Working in the week means that sewing time is precious in the evenings and this is why having a dedicated sewing space is so great, as it saves time having to set things up and pack things away all of the time. I try and sew a few times a week but generally have more time to get stuck into a project over the weekend, usually with a nice cup of tea and some biccies. I am a bit of a planner and like to make a mood board to help me decide how the final garment I am making might look - the idea stage is just as fun as the construction! In addition to our resident gecko I have two gorgeous little helpers who keep me company while making, Henry and Coco the Chihuahuas. Coco is a puppy and can often be seen running around the house having fun with rogue scraps or on occasions a snail (pin-free) pincushion! I’m not much of a fabric hoarder and only really have two main stashes of fabric. Interestingly my stashes mainly comprise of patterned fabrics that I’ve had for a couple of years now before I discovered my fondness for plainer fabrics. I love interesting prints but soon realised that although the pieces I’d bought were really striking, often they wouldn’t be something that I would necessarily wear. Nowadays I tend to gravitate towards plain, bold coloured fabrics and sew them up straight away, so they don’t hang about for long! As you can probably see I don’t have a great deal of space in my sewing area and unfortunately can’t quite squeeze in another desk for my overlocker. 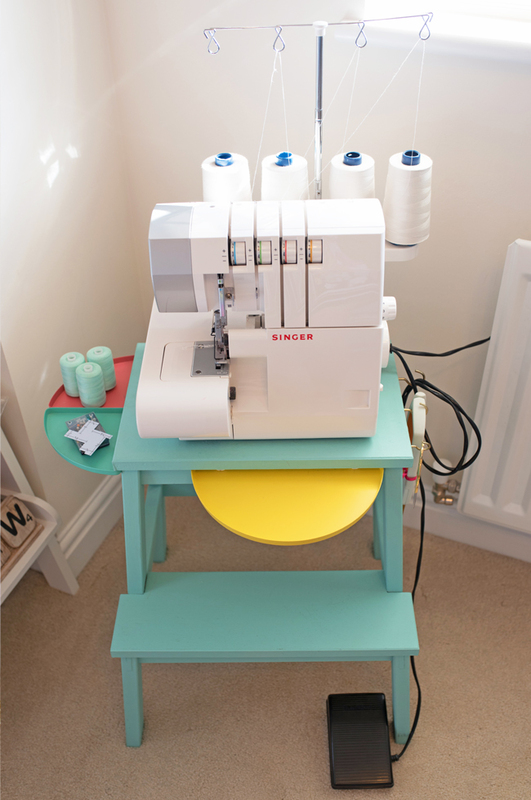 For this reason I hacked an Ikea footstool into an overlocking station by attaching a couple of tin trays, a few hooks and a lick of paint which now means that I can sew and overlock with ease – yay! Although I am a fairly new sewist, dressmaking has been in my family for generations. My most treasured possession is my dressmaking scissors given to me by my lovely mum who was a fanatical dressmaker herself! My mum sadly passed a couple of years ago and every time I use these scissors to make a garment it gives me a warming sense of pride and connection. My favourite guilty pleasure of all (even more so than fabric shopping!) is acquiring vintage sewing patterns. My pattern collection comprises of a few commercial patterns, lots of lovely indie patterns (notably Tilly and the Buttons of course) and my beloved, ever growing collection of vintage sewing patterns. 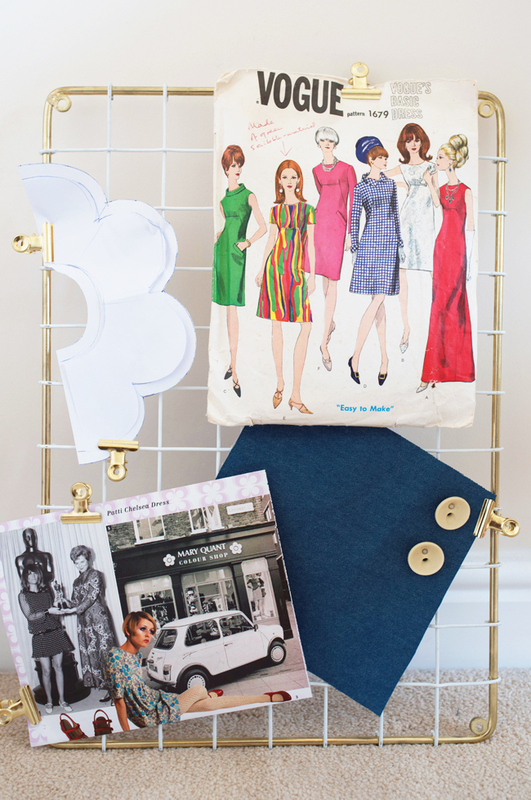 Over the past couple of years I have been lucky enough to collect patterns from various decades including the 40s, 50s and 70s but my favourite decade of all has to be the swinging 60s! I love the futuristic undertones in the styling of many of the garments from this period paired with the flamboyant expressions of colour. 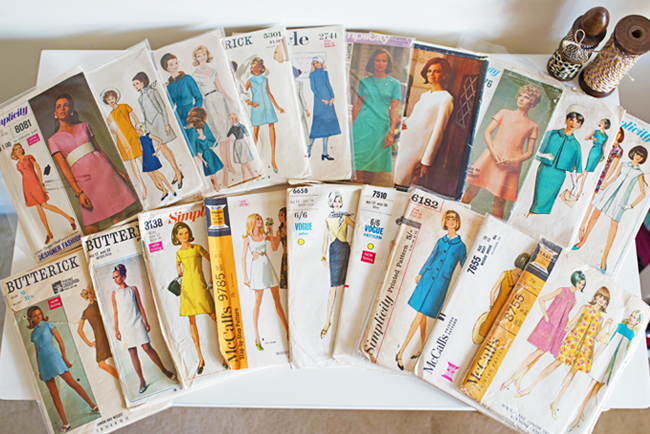 I think a wonderful thing about vintage sewing patterns is that they all have a story to tell and it is quite remarkable to think that they are still being enjoyed decades after they were first printed. I try to keep the most delicate patterns in cellophane sleeves, away from the sunlight to prevent them from aging any further and when it’s time to use a pattern, I tend to trace off all of the pieces onto tissue paper to try and preserve the original pattern pieces. Etsy and eBay are a vintage-pattern treasure trove but I have also found a couple of gems at vintage fairs…it can be a bit addictive though! The sky’s the limit... well, my spare room for now! Thank you so much for letting me share my little sewing space with you! 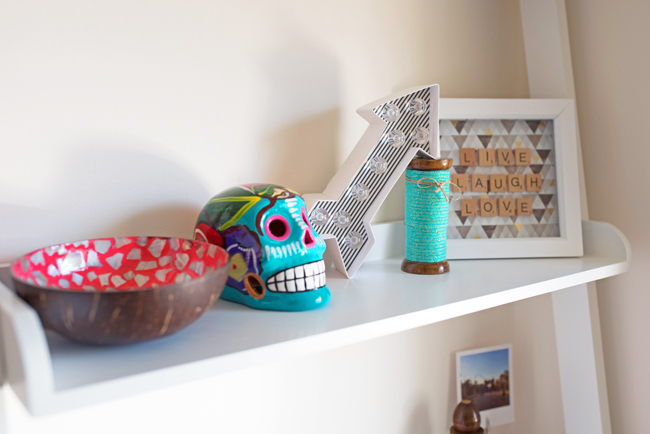 Thank you for sharing your lovely space with us, Jade. We'd love to spend an afternoon sewing with you, especially if Henry and Coco are around to assist! 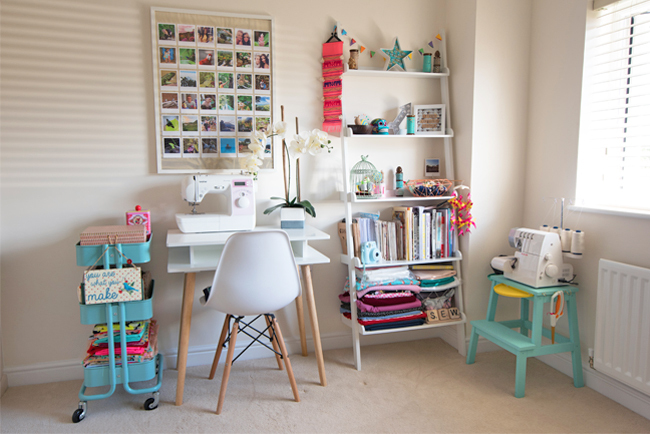 Fancy submitting your Sewing Space to be featured? Check out our submission guidelines. 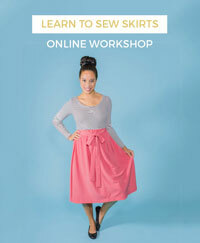 Wanna check out past Sewing Space Tours? Grab a cup of tea and get comfy, before delving into the archive. Perfect Coco Fabric is Here! Love at First Stitch - Finalement en français!